Pontiff condemns the use of chemical weapons in Syria. 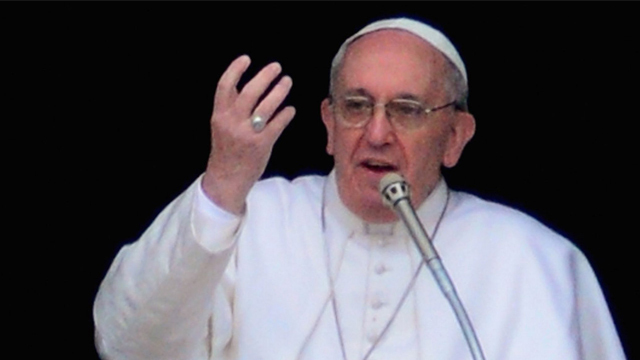 “Violence never leads to peace, war leads to war, violence leads to violence,” Pope Francis warned in Rome on Sunday. The Pope called on the faithful to observe a day of prayer and fasting next Saturday for peace in Syria, which he will lead with a special five-hour prayer vigil in St Peter’s Square on Saturday evening. He also invited all “people of goodwill” of different faiths or beliefs to join the initiative, as best suited to their beliefs. “My heart is profoundly wounded in these days by what is happening in Syria and I am anxious about the prospect of dramatic developments,” the Pope said on Sunday. “With all my strength, I call on the warring parties to listen to the voice of their own consciences, not to close themselves in their own interests but to look on the other as a brother,” he said. The Pontiff’s prayer initiative is scheduled just two days ahead of a meeting by the US Congress to debate possible strikes by the US on Syria. On Saturday, Pope Francis met top Vatican officials to discuss the situation in Syria. The Vatican has repeatedly pressed for a negotiated solution to the conflict in Syria, criticising plans for armed intervention. Christian minorities in Syria are concerned about the rise of radical Islam there and point to the Assad regime’s past record as a guarantor of religious diversity. They are also concerned that Syria may go the way of Iraq, where there has been a massive exodus of Christians due to the threat of violence and discrimination they face.